Planning a vacation? Need to get away for a night? Are you a frequent international traveler? With iPhone and iPad apps, you can research hotels, find great deals, and reserve in just minutes. We reviewed 11 free iOS apps for you to consider. Most of these booing apps are the streamlined app version of well-known and respected travel websites. Let us know what you think and if you have any others that you use regularly. TripAdvisor’s app for iPhone and iPad is a handy research tool filled with honest reviews of hotels, restaurants, and attractions. You search via city, zip code, or location, and in seconds, your list appears. The TripAdvisor iPhone app interface is loaded with options, but organized neatly and intuitively. With a touch, you can check out reviews of hotels, restaurants, and attractions that are quickly and easily sorted by distance, rating, and price. To book a hotel room, you are linked to Booking.com, Orbitz, hotels.com, Expedia, PriceLine, and Travelocity. You can reserve a table via OpenTable.com. The TripAdvisor iPhone and iPad app incorporates rich content and great functionality. hotels.com has developed an iPhone app that functions better than the website. From the home screen, you access deals, book a hotel, log into your account, and access reservations with a touch. The deals tab is filled with exclusive mobile promotions and discounts for last-minute getaways. You can search for hotels by using your device’s location services or plugging in a different city. The sorting and filter buttons are well-positioned at the bottom of the screen for an uncluttered feel. Also, the filters function well with responsive finger swipes on the screen. You have complete access to your hotels.com account including reservations and favorites. For a clean, lean, and mean hotel booking app, hotels.com iPhone app ticks all of those boxes. If you travel overseas, Booking.com iPhone and iPad app should be on your device. The defaults on the app are user-friendly, as the currency is adjusted to the hotel’s currency. This useful feature prevents the hassle of changing settings. You will also appreciate the ease with which you adjust parameters and filters. The Booking.com iPhone app incorporates plus symbols, so you can add guests, nights, and additional features with a touch. The hotel information is thorough without overwhelming your device’s screen. You book hotels directly through the app, and the process is smooth and well-planned. Booking.com’s iPhone and iPad app is filled with nuanced features to make it easier to reserve a hotel room anywhere in the world. Hotel Tonight’s iPhone app is clearly designed for a tech savvy, hip, and modern user. It is currently only available in certain urban markets, but continues to expand across the country. You’ll definitely want to make sure your favorite cities to escape for the night are on the list. The Hotel Tonight iPhone app creates its own distinctive categories for hotels—hip, luxe, and solid. Each selection has a scrolling photo banner of different shots of the hotel. Hotel details are presented concisely in a spirited tone. The app saves you the trouble of checking online reviews, as you can check out Yelp and TripAdvisor’s ratings in the info section. The complete room price plus taxes, fees, and additional upcharges like parking and wi-fi are fully disclosed prior to booking. Hotel Tonight’s iPhone app gets the excitement and fun of a great deal on a much-needed night away started. HotelPal’s iPhone and iPad app could be your best friend on your next road trip. The list of hotels is presented on a map. You can use your device’s location services, or you can put your finger on the map to find hotels in the area. If you know you are going to slog through another 200 miles, the HotelPal iPhone app lets you check out rates, hotel information, and book a room en route. The reservation is processed via Expedia. 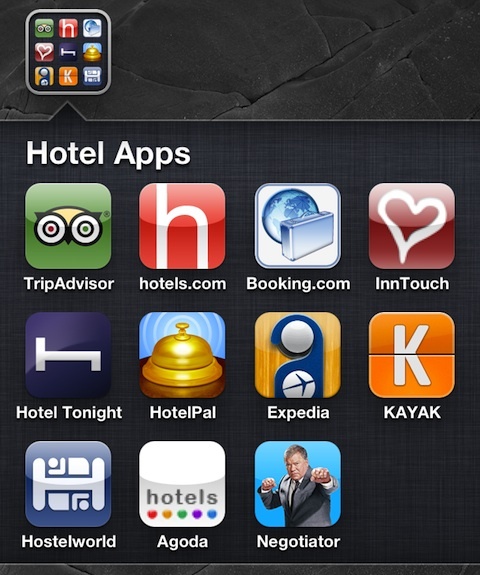 The HotelPal iPhone and iPad app is a helpful hotel reservation app. If you need an app to track all of your vacation details or you’re a travel nerd, then Kayak’s iPhone app is it. It literally contains everything you need to coordinate hotel reservations, flights, car rentals, area attractions, currency convertors, and packing lists, as well as flight trackers, airport information, and an airline directory for those unfortunate cancellations and delays that disrupt all of your careful planning. It is truly impressive that the Kayak iPhone app can cram loads of information and not overwhelm a user. The Kayak iPhone app is a must-have for hotel booking. If you are backpacking across Europe or traveling on a shoestring, then Hostelworld.com’s iPhone app will be vital. According to the app’s menus, you can “search over 25,000 hostels in more than 180 countries.” After you enter your location, hostels with the highest ratings are listed first. You adjust the list with sorting and filter options, as well as a map. You’ll appreciate the quick checklist of amenities. If you absolutely need a washing machine, then you’ll know with a quick scan. You book a room through the app with ease. You can store your account information for quicker processing. Hostelworld.com’s iPhone app successfully combines great information and excellent user experience. The Agoda.com iPhone app is an efficient, intuitively designed hotel reservation app. It is certainly designed for international travel, as the currency is easily manipulated from the bottom of the screen. When you select a location, the search bar helps narrow the search. For example, if you type in Paris, you have a list of the Paris in France, as well as the one in Texas. The hotel list feature has a neat folded corner to tap to access a map view. For each hotel, you are presented with the very basic facts like price and location. You access more details by touching the appropriate category. Generally, the details are presented as bullet points. If you like hotel information presented concisely, then the Agoda.com iPhone app is for you. Priceline.com’s iPhone and iPad app is not a subtle, understated hotel booking app. William Shatner does his thing on your device’s screen. So, be prepared for sound effects and the familiar “Priceline Negotiator” jingle. You can negotiate, see previous deals, and book hotels from the app. If you use the location services icon, you can see the three closest neighborhoods and deals. You then shake your device to negotiate. You slide your finger across the screen to choose a rate. The controls are responsive and intuitive. The notification and booking process work nicely and smoothly as well. There is a reason “priceline” has become a verb. The Priceline.com iPhone and iPad app pricelines with the same spirit and energy you expect from the television ads. The InnTouch app brings iLoveInns.com bed and breakfast reviews and information to your iPhone. The app prominently features selected B&Bs around the country, or you can search for specific locations. Each B&B has a large call button to encourage users to phone for reservations. The InnTouch iPhone app has that distinctive quality of harmoniously bringing mobile technology and old-school communication together. The detailed descriptions of the B&B, reviews, and photography allow you to make informed decisions, as you select the quaint setting for your weekend getaway. One of the special features you’ll value is the recipe stash. InnTouch Inns have provided hundreds of their treasured recipes. The vibe of the InnTouch iPhone app reflects the quaint spirit B&B lovers seek. AppSafari review of Best iPhone Apps for Booking & Reserving Hotels was written by Jenni Ward on December 12th, 2011 and categorized under App List, Free, Travel. Page viewed 11863 times, 1 so far today. Need help on using these apps? Please read the Help Page. I think Small Luxury Hotels of The World is a best hotel booking iPhone app in the App Store. It slick and has user friendly options to find and book hotels with good images and location informtion. Download from http://itunes.apple.com/gb/app/small-luxury-hotels-world/id359024705?mt=8. You gotta add http://www.xcitego.com to this list. there travelers can bid on hotel rooms in a real-time marketplace. unlike priceline’s “name your price” gimmick, this site really lets users place a bid, then with the power of multiple bids, hotels shop and accept them! check it out!